The G.I. Bill is America’s chief “thanks” to those who have given the most to their country; it is a ticket to the American Dream for most veterans – a chance to earn a college degree and the skills needed for the civilian workforce and a better future for themselves and their families. 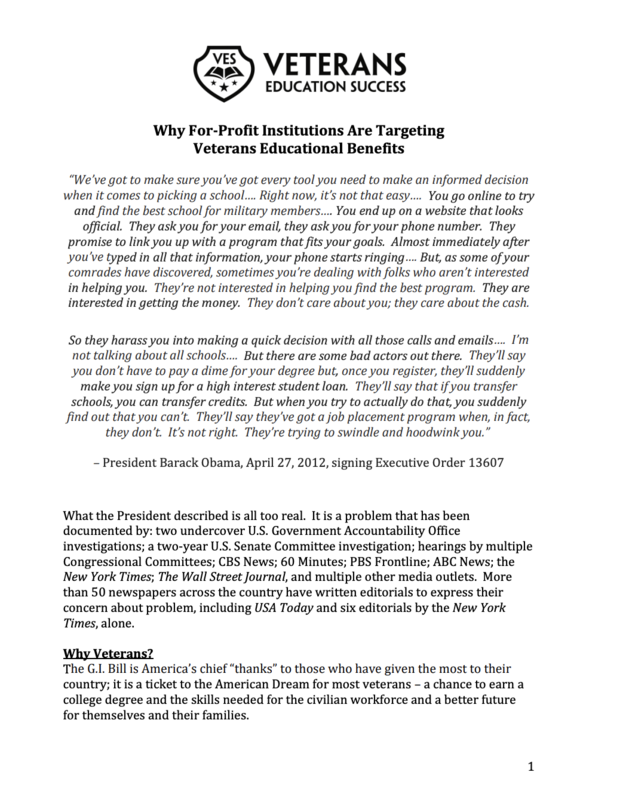 But veterans coming home from Iraq and Afghanistan are being targeted by very aggressive and deceptive sales pitches for low-quality, high-cost, for-profit colleges that have a financial incentive – because of an unfortunate loophole in federal law –to deceive veterans in order to get access to their G.I. Bill dollars. In a two-year investigation, the U.S. Senate HELP Committee found rampant deception by for-profit colleges about every aspect of the education they offer – the true tuition, the quality, the teachers, the classrooms, the lessons, the accreditation, the eligibility for licensing or jobs, the ability to transfer credits to nearby public colleges, the graduation rate, the job placement rate, career assistance, and even signing students up for high-interest private loans without their knowledge or failing to disclose the true terms of loans.